Too often the notion of emotional intelligence in a professional environment makes many break out in to sweat, experience palpitations, start trembling, shake really hard, have shortness of breath and feel anxiety. The reality is not near as bad as we think. 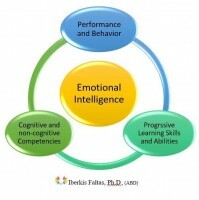 Emotional intelligence (EI) is a set of cognitive and non-cognitive competencies, skills and abilities, directly and essentially connected to the behaviors and actions of everyone, in every field, including the actions of public administrators, policymakers, managers and leader at any level of the organization bureaucracy. The three major models of EI—Goleman’s EI performance model, Bar-On’s EI competencies model, and Mayer, Salovey, and Caruso’s EI ability model— resulted from decades of research, analysis and scientific investigations. Those EI models focused on the individual’s cognitive and noncognitive competencies, skills and abilities, with the purpose of understanding what emotions drive human behavior. According to Goleman, EI is an array of skills and competencies that contribute to the performance of managers and leaders in the workplace. Those skills and competencies focus on four capabilities: self-awareness, relationship management, self-management and social awareness. These four EI competencies are the foundation of twelves EI subscales that include emotional self-awareness, emotional self-control, adaptability, achievement orientation, positive outlook, influence, coaching and mentoring, empathy, conflict management, teamwork, organizational awareness and inspirational leadership. According to Bar-On, EI is an arrangement of interconnected behavior driven by emotional and social competencies that influence performance and behavior. Bar-On’s EI model focuses on five EI scales: self-perception, self-expression, interpersonal, decision-making and stress management, and 15 subscales: self-regard, self-actualization, emotional self-awareness, emotional expression, assertiveness, independence, interpersonal relationship, empathy, social responsibility, problem-solving, reality testing, impulse control, flexibility, stress tolerance, and optimism, driving human behavior and relationships. The last one, Mayer, Salovey and Caruso, EI ability model focuses on perceiving understanding, and managing emotions, and using that information to facilitate thinking, and guide our decisions. Their EI framework emphases four branches of human abilities: perceiving emotions, facilitating thought, understanding emotions and managing emotions strive to enhance the advancement of new intelligence and more intelligent method of building trusting relationships. A closed analysis showed that in fact, EI touches and influences every aspect of our lives, from driving our behavior, making decisions, solving conflicts, the way we feel about ourselves, how we communicate with others, and how we manage everyday stress, to the way we perform in the workplace, manage, and lead teams. EI influences every aspect of our personal and professional development, helping us to advance, mature and reach our goals. In public administration, EI enhances and endorses the type of human behavior that promotes fairness, social justice, social balance, leadership, trust, respect, motivation, growth and excellence. EI improves and help us to build stronger relationships, influencing our senses, from the way we perceive, to the way we think about the world around us. It is extremely important to understand the distinctive characteristics between emotions and EI. Emotion is a natural instinctive state of mind that derives from our current and past experiences and situations. Emotions originate in our environment, circumstances and knowledge, as well as our moods, and relationships. Our feelings and experiences influence our emotions. Conversely, EI is the ability, skill and awareness to know, recognize, and understand those feelings, moods, and emotions, and use them in a positive way. EI is learning how to manage feelings and emotions, and use that information to behave and act, including making decisions, solving problems, self-management and leading others. The Consortium for Research on Emotional Intelligence in Organizations focuses on the advancement, research, and better practice of EI in organizational settings. Scholars in the organization believe that EI competencies, skills, and abilities are essential to a healthy and productive environment and behavior. Decades of academic research and scientific investigations allow the scholars to validate that EI enhances productivity, satisfaction, relationships, goals, and many other aspects of the individuals’ professional and personal life. Further, scholars validated and highlighted that EI enhances self-esteem, well-being, as well as professional and personal motivations. Academic research validated that EI competencies, skills, and abilities hold the key to greater career success, which in current modernism comprises the 80 percent of employee success, distinguishing the best from the average. All public servants, managers, leaders, policymakers and executive management, regardless of their professional fields and area of responsibility must learn EI capabilities. The knowledge and awareness linked to EI will help them to have a better understanding of their constituents, as well as a better control of their temper, frustrations, behavior, performance and communication methods. Goleman said: “people do not leave the company, people leave bad bosses.” I concur with his statement. Keep it in mind when building your next team, writing your next policy, or communicating with the person next to you.